What do you do with your Okra? Okra or more commonly known as Ladies finger in some parts of a the world is a green tender vegetable with sticky pods/seeds inside. 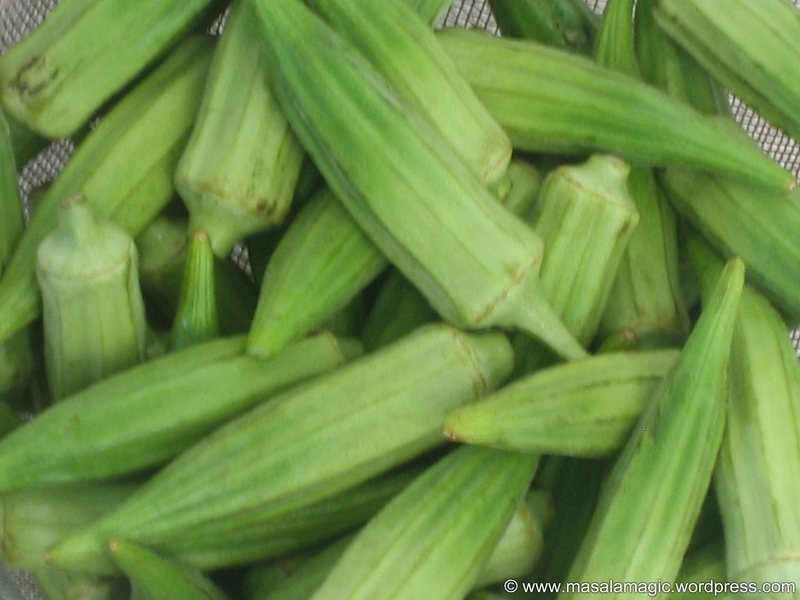 Here in America I have seen okra being cooked in only two forms – breaded okra – which is okra sliced and coated with a breaded mixture and then deep fried or in a gumbo which is a thick chunky soup like dish typically made with meat and vegetables. 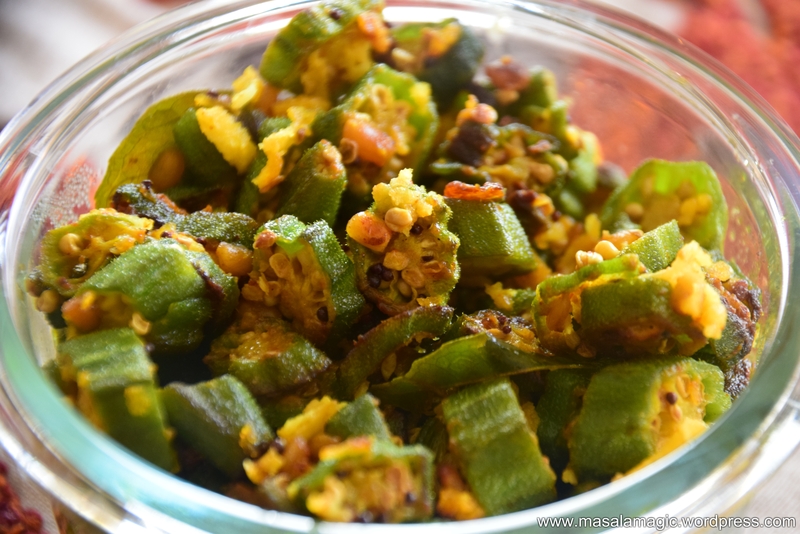 In Indian cuisine we have several dishes we make with Okra. Okra also called ladies finger or “Bhindi” in Hindi is a really delicious vegetable that is popular both in South and North India. 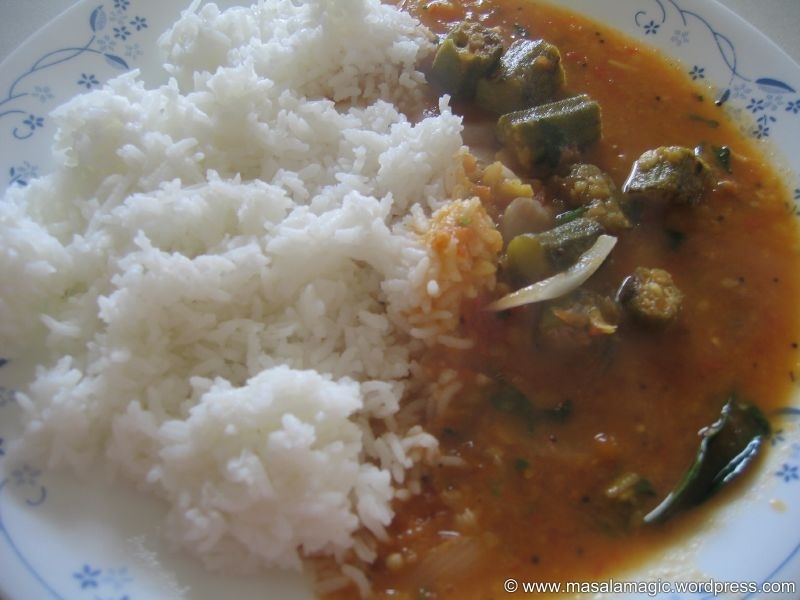 On the menu today is comfort food – Okra Sambar served with Rice. Note: There are multiple ways to make Sambar. This is one simple method. The primary taste in sambar comes from the Sambar Powder used. I primarily make my own Sambar powder, for which I will share the recipe later. Alternatively, you can use store bought Sambar powder – there are multiple brands available in the market today. 1. Pressure cook the toor dal and Tomato with 2 to 3 cups of water and a pinch of turmeric. 2. Soak the tamarind in water for about 15 minutes. Squeeze and save the pulp. 3. In a pan, heat a tsp of oil. Add the chopped okra and fry the okra on low to medium heat stirring in between. Fry for about 10 minutes until the okra looses the stickiness and is shrivelled and well saute’ed. 4. In a saucepan add the fried okra, tamarind pulp, 1/2 cup water, salt to taste, sambar powder and cooked tomato (mash the tomato a little). Cook this mixture for about 5 to 10 minutes. 5. Using a ladle, mash the cooked toor dal. 6. 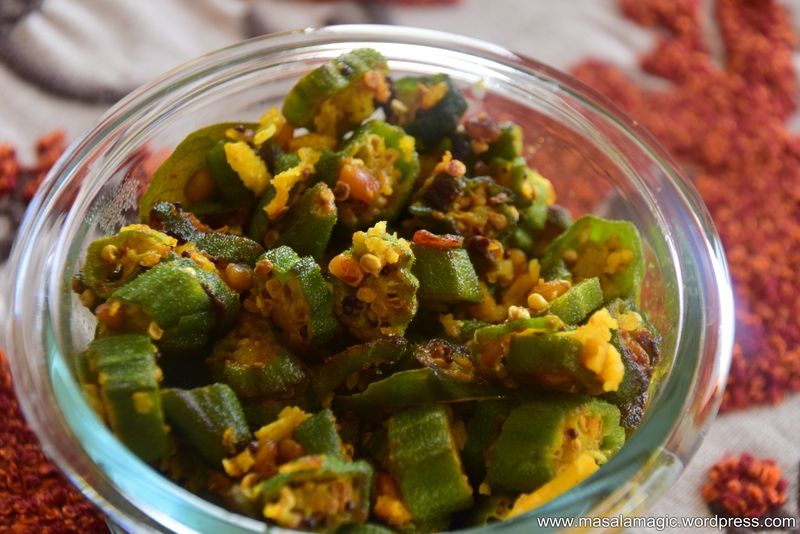 Add the mashed toor dal to the above okra – tamarind mixture and cook until well blended. Add about 1 cup of water (or as needed) to ensure a semi liquid consistency. 7. Add more salt to taste. 8. For seasoning, heat a pan with the oil. Add the seasoning ingredients. Allow the mustard to splutter.Add onions and saute until light brown. Pour this seasoning mixture over the sambar. 9. Garnish with chopped cilantro (optional) and serve hot with rice.